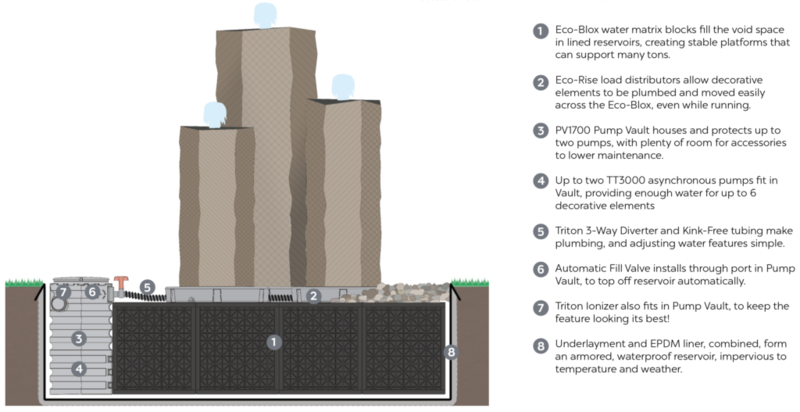 Do you have any additional information about building and calculating an upflow bog with EcoBlox, like shown in the graphic at the end of this blog post? You already talked a bit about the surface area of the bog compared to the pond but what about the depth and the number of blocks stacked on each other for example? I want to build a 15′ x 13′ pond with 3000 gallons and 9′ stream. Pond will be filled with stones and gravel, some plants and 20 goldfish (around 8″). How many blocks do I need and how do I arrange them for a fitting surface area of the filter? Do you have any recommended product to be used as tube under the blocks? Or do I have to build one myself? If so, do you have any instructions to do this? Great question O Noble Ponderer! Bogs are sized by surface area. 10% of the area of the pond in bog area is sufficient to consume all the nitrates a goldfish pond is likely to produce. At the other end of the scale are Koi, which need three times as much area, 30%, planted to bogs. With 205 square feet of pond, 20 square feet of planted gravel will be sufficient. You have a 9’ stream, which simplifies matters greatly. 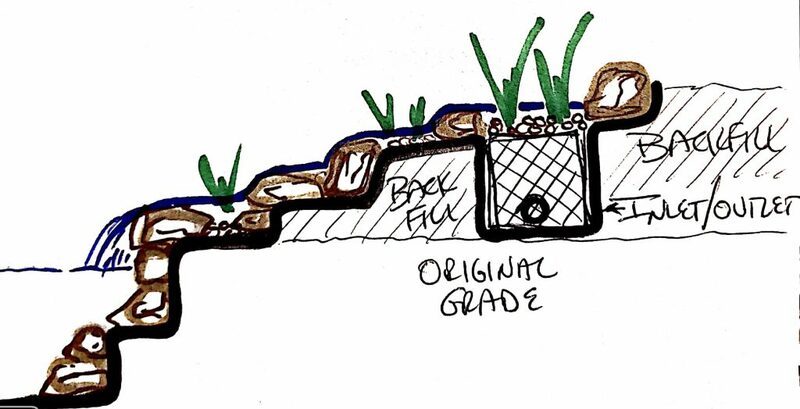 What I would do is set one or two Eco-Blox at the top of the stream, on the existing grade on top of the stream liner. I would install two 2” or 3” flanges or bulkhead fittings on either side of the chamber thus created, down low so water enters and exits the Eco-Blox near the bottom of the block. On one side I’d attach the pipe from the pump, on the other a drain valve. Take a look at the sketch. 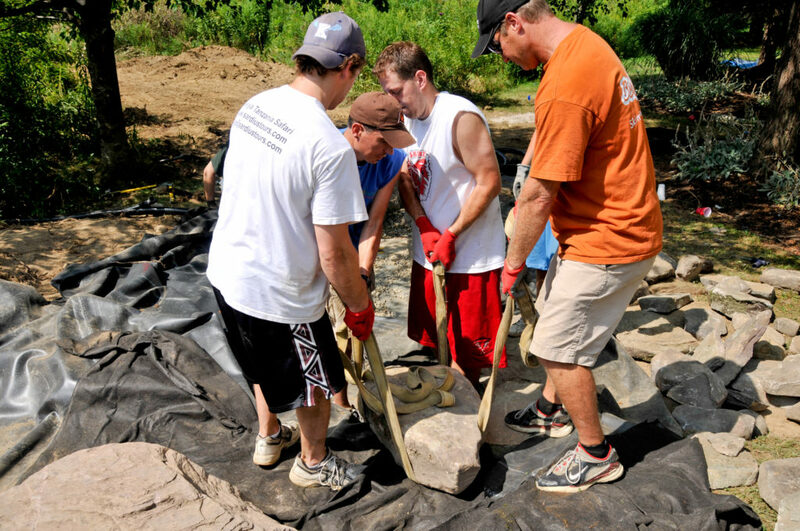 Water comes from the skimmer into the Eco-Blox on one side, flows up and out through a 4-6” layer of ¾-1” gravel on top planted to various low grasses or other aquatic plants, which are also planted in the gravel of the stream. 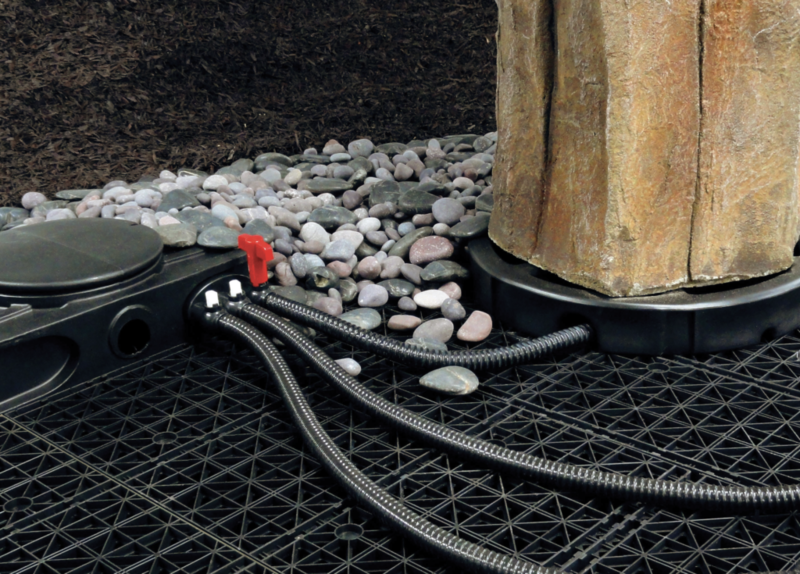 The Eco-Blox under the gravel acts as a settling chamber. The outlet on the side opposite the inlet is valved. The valve is buried near the flange or bulkhead fitting, attached to a piece of pipe out to daylight somewhere. I usually just set an 18” length of 4” pipe vertically over the valve so the handle can be accessed periodically to drain out the muck which will accumulate in the chamber. If I can’t reach the valve with my hand, I’ll slot the end of a pipe to create a wrench to turn the handle. This is necessary usually only once or twice a year. 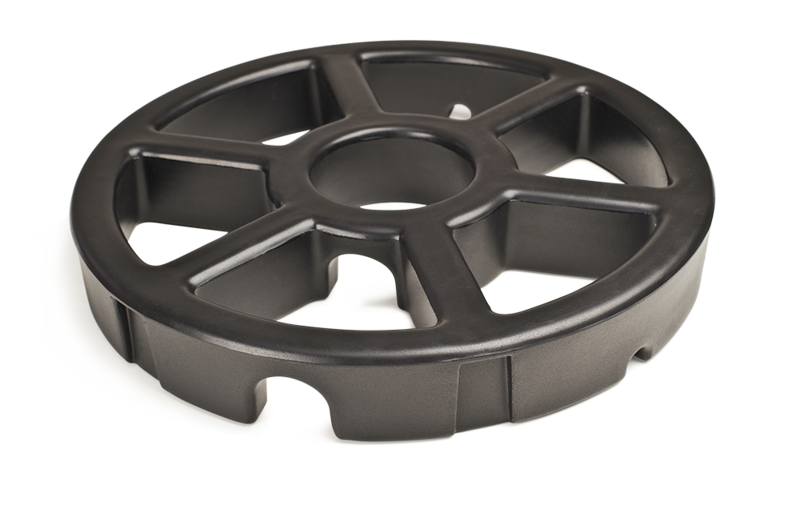 You’ll have a great little active bog filter that uses the top of Eco-Blox chamber plus the stream to provide the necessary area for plantings. Plus a built-in settling chamber that will remove much of the suspended organic debris constantly and automatically. You may also consider adding a bottom drain to the skimmer, to pick up the rest of the debris. But that’s the subject of another post. A great new way to hide power cords! Even the nicest water feature installation can be ruined if the cord for a pump or a light is visible, as they often are. Power cords should be removable, so that lights or pumps can be serviced or eventually replaced. They can’t just be buried away in concrete. 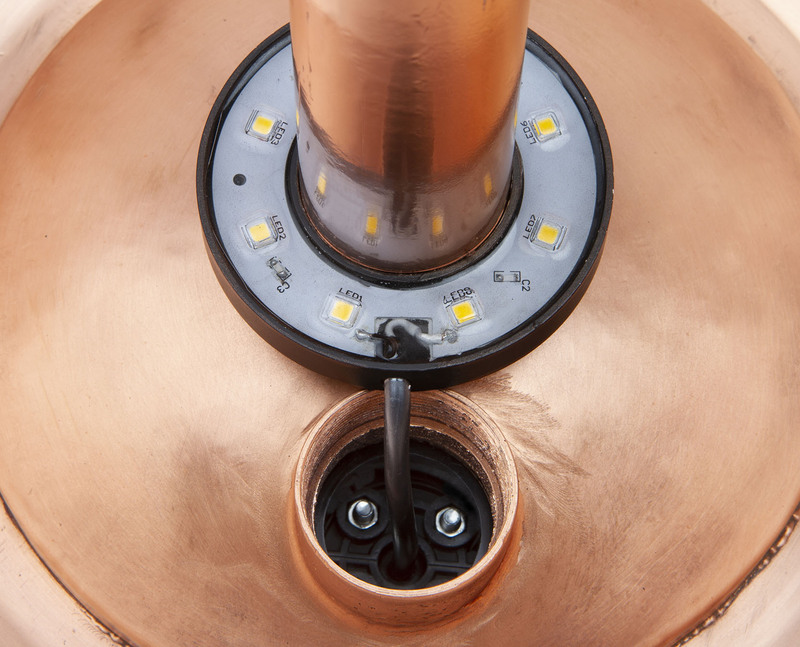 With open reservoir water features, like ceramic vases or copper basins, a hole in the reservoir that’s big enough to pass a plug is hard to seal, and cutting the plug off voids the warranty on pumps and lights. Wouldn’t it be great if a power cord could pass through the same bulkhead fitting that the water feeds through? Without leaking? That way, a light could be set inside the reservoir without a cord draping over the edge, or a pump cord inside a basin could pass through a plumbing fitting, virtually invisible. But, even if you ran a cord inside a pipe from inside the reservoir, how would you get it back outside of the pipe, outside of the reservoir? Enter the CSF. 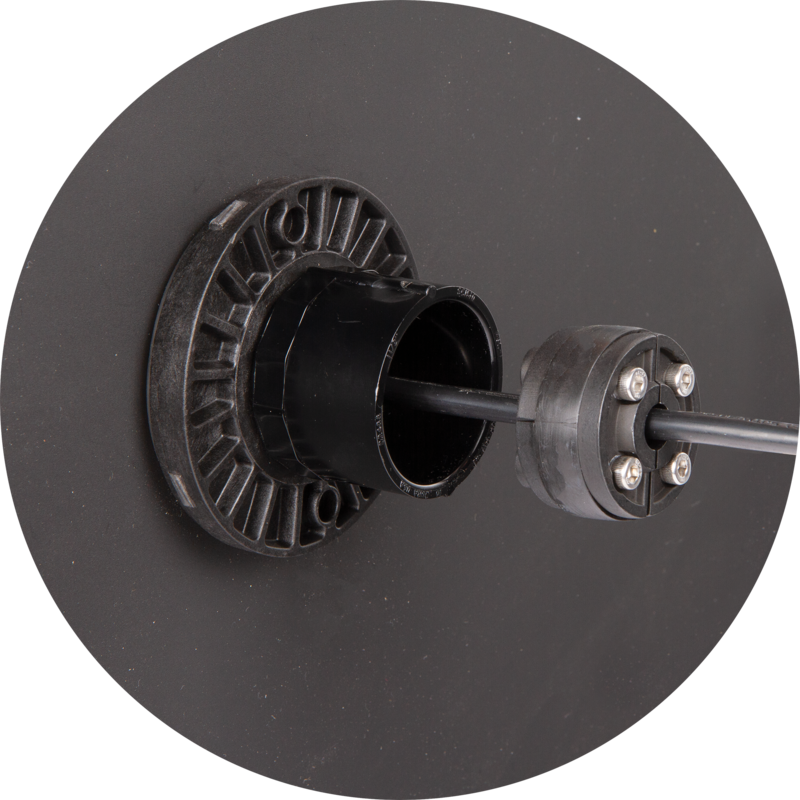 The Cord Seal Fitting is a nifty gadget that addresses that particular need, to pass a cord through the wall of a reservoir inside the fitting or pipe that is the reservoir’s only perforation. It works much like a plumbing pressure test plug. A rubber gasket squeezed between two plates expands outwards and seals off a 1-1/2″ female socket. But, unlike a test plug, the rubber doughnut is slit to its center to accept a standard light or pump cord. The plates on either side of the gasket are also split, to assemble around the cord and gasket like the cookies around the creme of an Oreo. When tightened, the rubber expands tightly around the cord and into the fitting, creating a waterproof seal. As is often the case, the Cord Seal Fitting is far easier to use than to describe. Install a tee in the 1-1/2″ waterline feeding the reservoir and pass the cord through the tee and into the reservoir. Loosen the plates on the CSF, slide the cord into the gasket, reattach the plates and tighten the CSF in the opening of the tee. The gasket will expand and seal against the cord and the inner walls of the tee. The CSF will also allow the cord to pass in and out of a sealed section of pipe, with the addition of a second tee. This is useful where a pump may be hard piped from the inside of a reservoir, out through a bulkhead fitting and up to a spillway. The illustration to the right shows the pump cord passing out of the reservoir through tees through a tee installed on either side of the bulkhead fitting and sealed with Cord Seal Fittings inside and out. Another great solution from the folks at Atlantic! 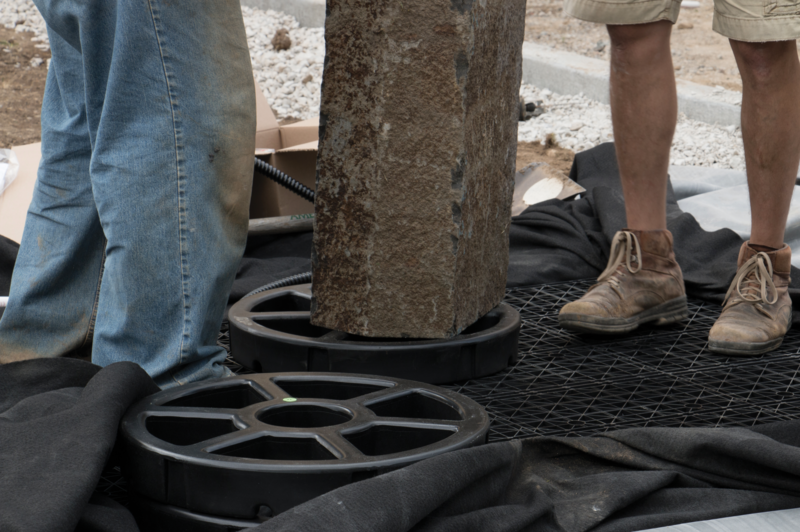 Bubbling Basalt Columns and overflowing vases set on buried Fountain Basins are attractive, easy and profitable add-ons for the irrigator, landscaper or hardscaper. 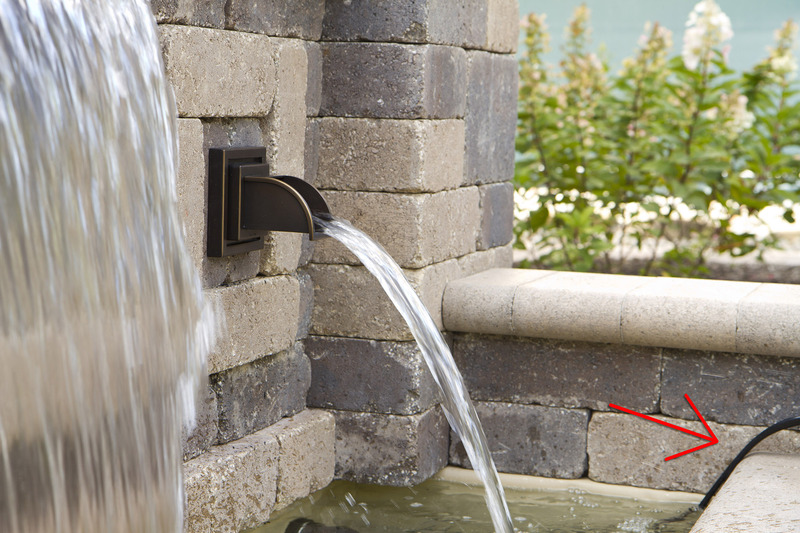 These water features are especially popular with contractors who only occasionally venture into water (so to speak) because they are simple to build, easy to maintain and rarely require call-backs. 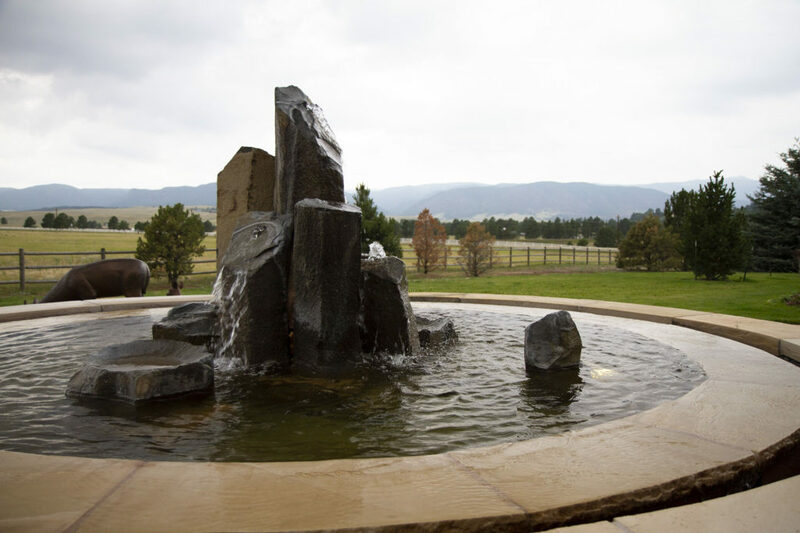 As a bonus, the successful completion of one project usually leads to another, as friends, visitors and neighbors ask about the fountain and decide to put one in for their own enjoyment. But what happens when the next job requires a boulder too big for the basin? A vase too vast? A mountain of a fountain? 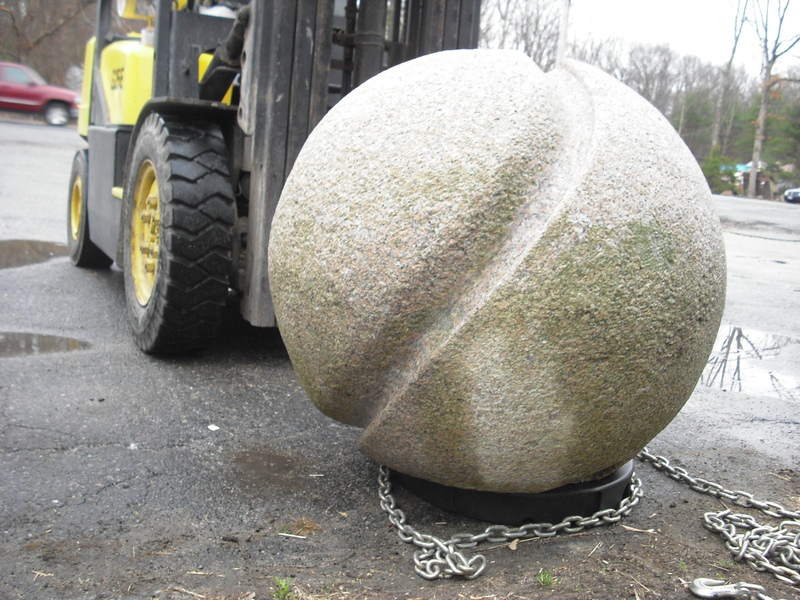 In the old days, BA (Before Atlantic), installing a one-ton fountain piece, like a 36″ granite sphere, was a month-long project. The contractor would design a concrete basin large enough to catch splash and strong enough to handle the load. Waterproofing would depend on climate. In the north, the design would have to deal with freeze/thaw cycles and excavating below the frost line. After digging to the proper depth and tamping the bottom, the plumbing would need to be set, with no room for error, as it would literally be set in stone. Then the concrete trucks would arrive. After the four-week curing period (ouch! ), the sphere could be carefully lifted by machine, plumbed in the air, then lowered into place, hopefully without crushing the plumbing. 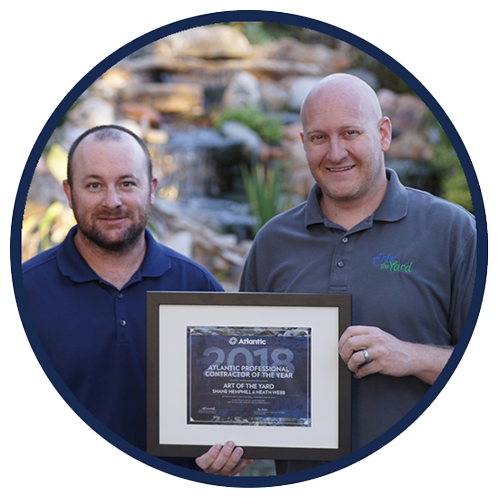 The Atlantic Eco-Rise System allows two men with two wheelbarrows to complete a two-thousand-pound granite sphere fountain install – in two days. Like most good systems, it’s simple, with only three structural components, plus liner, pump and plumbing. Instead of formed and poured concrete down to the frost line, the reservoir is just a rubber-lined hole a single layer of Eco-Blox deep. The Eco-Blox may look like milk crates, but the similarity ends there. Our Blox come disassembled, lock solidly together and support 7 tons of distributed load without crushing. The Eco-Rise is a load distributor that supports the sphere, and much more. Rated at three thousand pounds, the Eco-Rise spreads the weight of the stone across the tops of the Eco-Box while protecting the plumbing. Install the pipe into the sphere, roll it onto the Eco-Rise on the Eco-Blox. With the flex pipe in place, the sphere can easily be moved and adjusted by hand, without a machine! 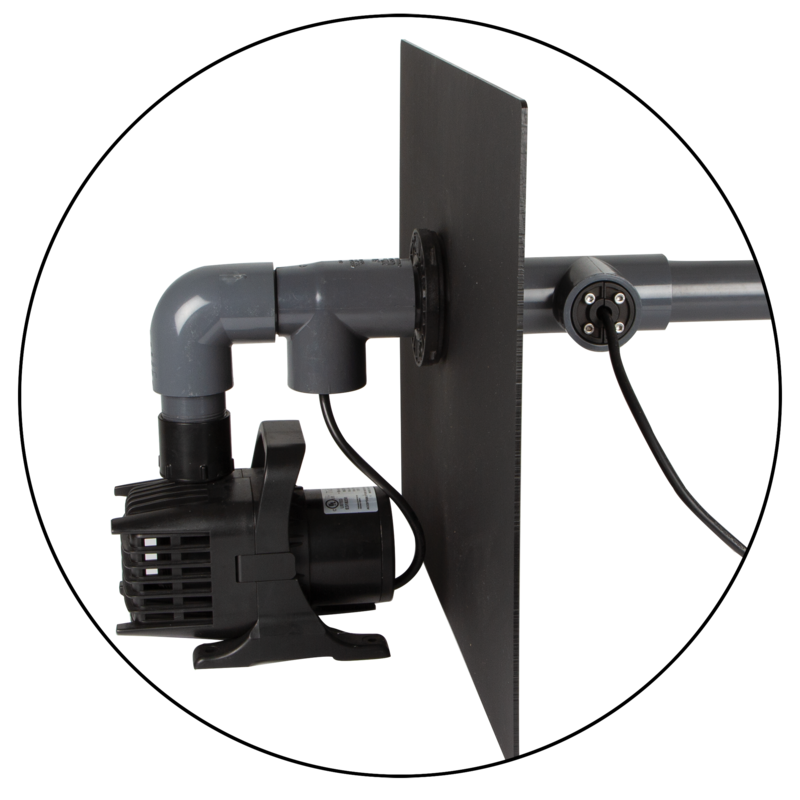 The third component, the PV1700 Pump Vault, houses and protects the pump. Hook the pipe to the pump in the Vault, and you can adjust the sphere, by hand, even while running. Then, cover the Eco-Blox with two wheelbarrows of gravel and go home early. Atlantic. We’ve got you covered. I certainly hope that phrase evokes a pleasant visual for all of you out there. It certainly does for me. The first time I saw it I thought, nice – wow that looks good…. The second time I thought it looked even better. The third time I really wanted to get up close and personal. I just had to. So I asked my buddies about the Hat. You’ve probably seen somebody wearing it. You may know the one – looks like a solid suede brim, with a vented crown, jaunty little leather braid and a chinstrap. Sharp looking hat. But the Kakdu Soaka hat isn’t suede at all, it’s made of an absorbent microfiber. Just dunk it, shake it off and wear it. Water trapped in the microfiber slowly evaporates as air circulates through the vented crown, lowering the temperature of both the hat and the head under it. Sort of a wearable swamp cooler. Down in sunny Lake Wales my buddy Lloyd swears by his fully vented Soaka Breeze. He says it keeps him going when the temps soar into the 90’s. 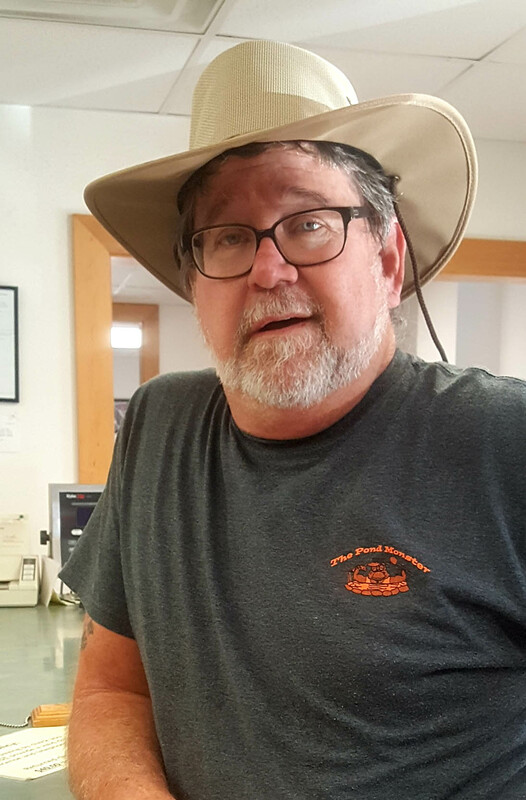 Another buddy, Sean, up Boston way, thinks so highly of the hat he mail-ordered a bunch of them when they were hard to get a couple of years ago. Nobody had them in stock for quite a while, so he’d order them from another company just to find out they were backordered there too, and so on. Waited almost a year, then everybody shipped at once. Now he’s got’em in every color. Wears’em constantly. The Kakadu Soaka Breeze is just one of twenty plus styles of Soaka hats, some with more venting, some with solid microfiber crowns, but all share the same cool feature. The one I got the best picture of was Sean’s, a relatively fresh one that hadn’t yet really broken in. (Lloyd’s, on the other hand, was a little too, ah, personalized by wear, shall we say? for close inspection.) I got mine direct from Kakadu’s Washington State distribution center by mail order, but you can find them in plenty of other places too. If you work outside where your brain boils in the sun (and who doesn’t? ), these hats are really worth trying. And at around $40 most places, you can cool the burn without frying your wallet.